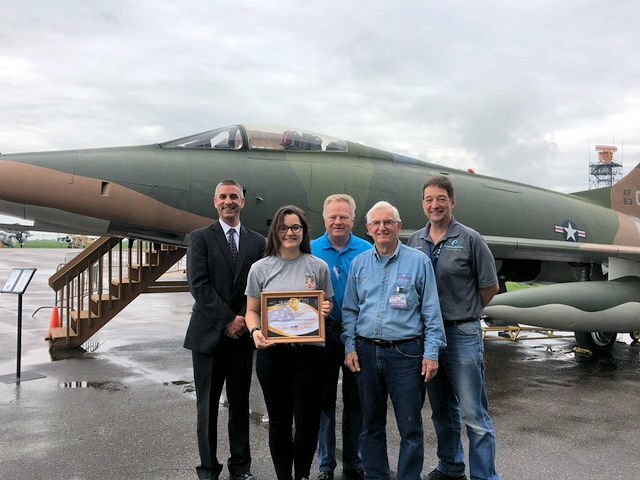 The Friends of the Super Sabre awarded its first Lt. Col. Robert L. Dunham Jr. Memorial Scholarship on May 15, 2018 to Hannah Shockley. Hannah is a student at Portage Lakes Career Center, Uniontown, OH. She is also enrolled in the Aeronautical Technology program at the Military Aviation Preservation Society Air Museum. The scholarship is awarded to students enrolled in aviation programs and who plan to attend college in an aviation career field. Hannah was an outstanding choice as she excels in both academic and practical course work, maintains an exceptional attitude, a maturity level beyond her peers, and works with the highest level of honesty, integrity and responsibility. In August, Hannah will enter the University of Cincinnati in the school of Aeronautical Engineering.